Aesteiron Steel Pipes is a export unit of Aesteiron Steels Pvt. Ltd. We are manufacturing & supplying ASTM A106 Grade B Seamless Pipe, astm a106 seamless pipe, A106 Grade B Pipe, A106 Grade B Seamless Pipe, A53 Grade B, A333 Pipe & A106 IBR Approved Pipe since 2 decades. Aesteiron Steel Pipes is the first company in the world who has come up ecommerce website where you can choose a106 grade b seamless pipe sizes & can order online for Black seamless (welded not permitted) fully killed Carbon steel pipe for high-temperature, high-pressure service, A106 Steel pipe is available in three grades of seamless pipe of varying strength, it was a great need of top project consultants, engineers, Oil & Gas Industry as based on several service conducted by different organization in the world that it is a big challenge to procure right astm a106 grade b pipe for complicated applications. Aesteiron Steel Pipes is come up first time an online platform where project consultants & engineers get differences & comparison between 3-4 grades of Carbon Steel Pipe such as A106 Grade B, seamless pipe astm a106 grade b & A53 in a single window. 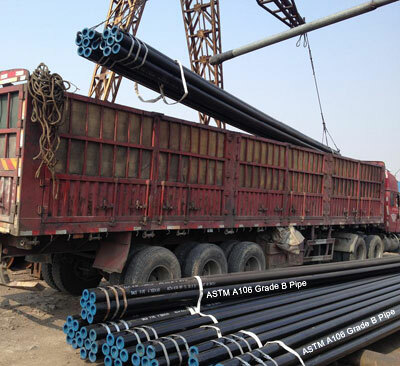 Although the physical and chemical properties for Grades A and B are comparable to those for A53 pipe, and the types of testing required for both specifications are similar, the tests prescribed for pipe astm a106 grade b are more stringent and are applied to smaller lots of pipe. Therefore, A106 is preferred for exacting services. Grades A and B are obtainable in most sizes and schedule numbers, Grade B permits higher carbon and manganese contents than Grade A. The pipe astm a106 supplied by ASTM Seamless Pipes has a maximum carbon content of 0.23%. It will help a lot to choose right Carbon Steel Pipe with appropriate grade with best price. You can search any size & grade in steel seamless pipe to compare pricing. Before you buy ASTM A106 Grade B Seamless Pipe you must check our free sample, we are offering best price in Asia. 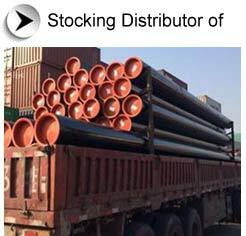 Aesteiron has sales Representative & Stockyard in Netherlands, Venezuela, South Africa, Indonesia, UAE & Australia, in our Netherlands stockyard we have ready stock of ASTM A106 Grade B Seamless Pipe,ERW Steel Pipe, LSAW Steel Pipe, Seamless Steel Pipe, P22 Pipe, sa213 t11, S/A 53, API 5L Line Pipe & A 106 Grade B Pipe of world's renowned manufacturers like Tenaris / Dalmine-Italy,Vallourec-Europe, Vallourec Star-USA, Productos Tubulares-Spain, Jiangu Chengde Steel Tube-China, Tubos Reunidos-Spain, Chomutov-Czech Republic, Huta Batory-Poland, Siderca-Argentina, Mittal Steel-Czech Republic Romania, NKK / Tenaris Japan, Volzhsky Russia, Tamsa-Mexico, Productos Tubulares-Spain, Niko Tube-Ukraine, Heng Yeng-China, Lubao Steel China Suzhou Seamless-China and YYC-China etc. 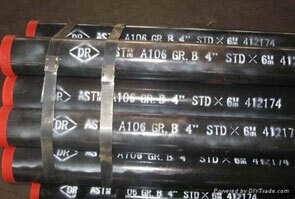 astm a106 grade b pipe sizes: NPS 1/4"- 30"
a106 pipe Schedule 20 - Schedule XXS (heavier on request) up to 250 mm thk. The main perceived advantage of pipe a106 is that they don't have a weld seam. Traditionally, the seam of welded pipes has been viewed as a weak spot, vulnerable to failure and corrosion. For many years, this fear was probably justified. However, in recent years improvements in the manufacturing process for welded steel pipes and other welded pipes have boosted the strength and performance of the weld seam to levels indistinguishable from that of the rest of the pipe. a106 pipe provide peace of mind. Although there should be no issues with the seams of welded pipes supplied by reputable manufacturers, a106 steel pipe prevent any possibility of a weak seam. ASTM A106 Grade B Seamless Pipe Special Testing is available? 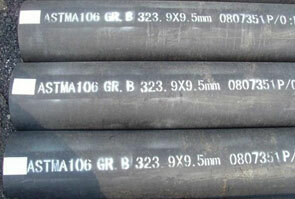 Do you stock Chinese standard ASTM A106 Grade B Seamless Pipe? As we are supplying ASTM A106 Grade B Seamless Pipe globally so we have our dedicated sales representatives & technical consultant engineer in Nigeria, South Africa, Australia, Italy, Iran, Iraq, Israel, Turkey, Spain, Indonesia, Saudi Arabia, Oman, Qatar, Kuwait, South Korea, Canada, Japan, Yemen, Netherlands, Singapore, Malaysia who can provide you detailed information about A106 pipe & comparison with other grades which will help you to choose the right steel pipe for your project at lowest price available in the market. For free consultancy or technical query you can send mail to our technical experts. (On Tags attached to each ASTM A106 Grade B Seamless Pipe Bundle in case of Bundled Pipe) Rolled, Stamped, or Stenciled (Mfrs. Option) Manufacturer’s name or brand. Length of pipe. A106 A, A 106 B, A 106 C. ANSI schedule number. Hydrostatic test pressures and/or NDE; Weight per foot (NPS 4 and larger) or NH if neither is specified. Additional “S” if tested supplementary requirements.